December is the season of joy. Also, the season of giving and receiving gifts. Stores fill their windows with an abundance of gifts for us to receive. 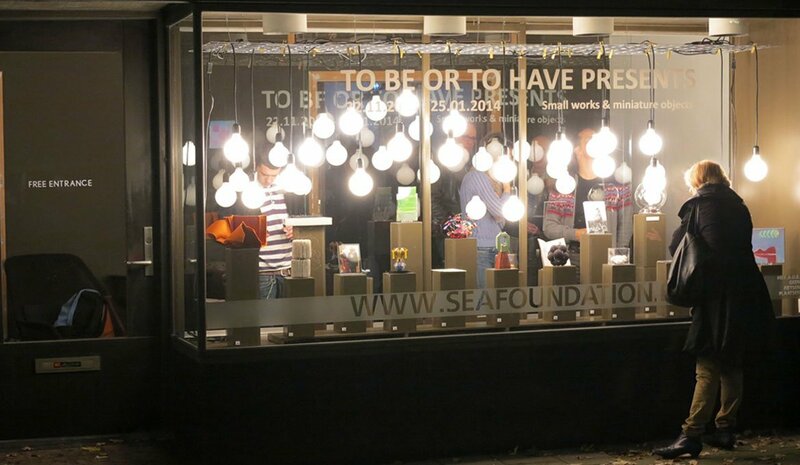 In the spirit of the season, the team of SEA curated an exhibition with the title “To be or to have Presents”. As from the Platonic thought, “being” and ”sharing”actually share the same connotation, the central theme of this exposition evolves around the question on how “being” and “having” are practically in relation to “giving” within our contemporary consumer-based society. 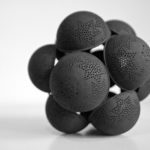 Although the exchange and sharing of goods of all time, 21st century technology can be said to have propelled a new philosophy surrounding product and service exchange. Aided by the possibilities of freely sharing content such as video’s, photos and knowledge on the internet, a new form of the concept of sharing gains prominence within our society. This sharing of goods and commodities provides us with new ways to group ourselves resulting in the growth of a shared and collective force that now and then successfully prevails over “The Ego”. This form of sharing and giving provides individuals with the power to actively resist the philosophy of consumer culture. As part of (online) communities, we have the possibility to become self-sufficient again while escaping the rules and regulations of the economy. Shared desires and needs are for instance affirmed by the giving of “likes”, and it is here that the new collective force is validated and able to grow. New types of social cohesion are formed. How do the new ways of “having” and “giving” affect our “being” in the world. In sync with the Holiday season, this exhibition is build up around this new contemporary use of the concepts of “giving” and “receiving”. What does it mean to give and receive nowadays, and how can this be translated to our “being”? The act of giving often transpires out of a certain desire in the gift-giver aimed at achieving a certain experience in the receiver. But the desire the artists wants to convey can be far removed from the desires present in the receivers. How do “giving” and “receiving” interrelate in such a situation? And how do both concepts interrelate with the concept of ”having” in an age where possession is fragmented? How can the acts of “giving”, “receiving” and “having” be translated in art? To be or to have presents places a critical note at traditional gift-giving conventions and the reciprocal pattern of expectation both givers and receivers have to deal with in this process. “To be or to have Presents” is an exhibition that displays twenty small works made by a colourful assemblage of artists, ranging from the old to the young, the local to the international and from the established to the “still-exploring-their-artistic-path”. Although working from different disciplinary backgrounds, the artists are connected in their expression of “slow-art”. Accompanying the exhibition is a (digital) publication which contains visuals of the individual works, artist biographies, and an introduction written by Frank G. Bosman, drs. cultural theology at the University of Tilburg. This exhibition is an initiative of SEA Foundation, a non-profit, privately managed artist network organisation with close tabs on the visual arts scene. Originated out of the voluntary efforts of many, including artists and staff, the exhibition is accessible twenty-four hours a day, seven days a week, in the display-window at Tivolistraat 22, Tilburg.